A POPPY Cross was not placed at the war memorial on Rhu village green on Remembrance Sunday 2017 — but it was not far away. 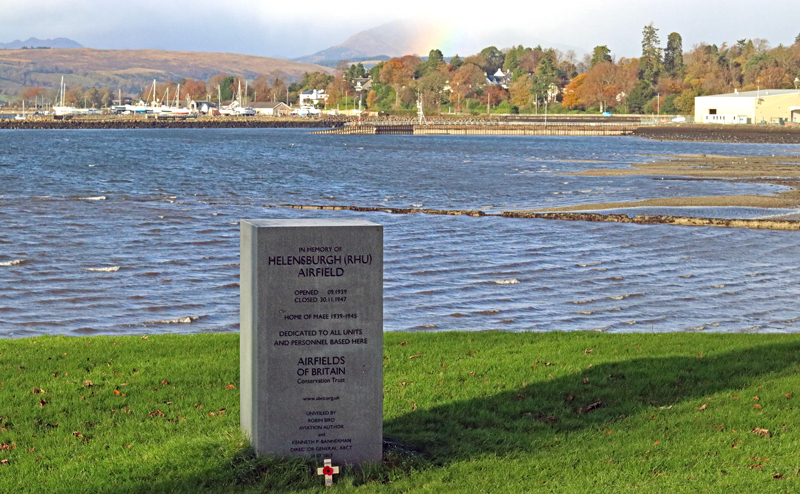 The cross, in memory of those who were killed serving with RAF Helensburgh during World War Two, was placed at the nmemorial in Kidston Park, erected in the summer, overlooking its former Rhu Hangers base. Dedicated to all those who served at the Marine Aircraft Experimental Establishment in Rhu and Helensburgh, the memorial was unveiled on July 1 on behalf of Helensburgh Heritage Trust and the Airfields of Britain Conservation Trust by retired Merseyside newspaper editor Robin Bird, author of two books about MAEE, and ABCT director general Kenneth Bannerman. The fatalities suffered at this flying boat base were the result of what were described officially as ‘flying accidents’ involving RAF pilots, crew and civilian staff while conducting trials. RAF Helensburgh also operated land-based aircraft from Prestwick and later in the war from Ayr and Isle of Islay — and this lesser known land-based also suffered fatalities. One such flying accident was touched upon at the official unveiling of the memorial. It involved RAF Sergeant James Norman Sparkes, a bomber aimer with the MAEE. October 17 marked the 72nd anniversary of his death in 1945, and Robin Bird, whose father Bob was the MAEE photographer for two years during the war, said that his story should be told. He said: “Anyone who has followed Channel 4’s acclaimed ‘WW11 Escapes; The Freedom Trials’ will have an idea what Sparkes went through. “Occupied Europe was a terrifying place for anyone who defied the Nazis, from stranded Allied servicemen to resistance fighters. 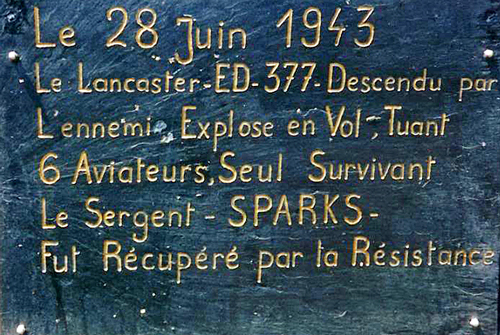 James Sparkes, who was 24, followed a similar route after he was the only one to cheat death when the Lancaster bomber ED377 blew up over France on June 28 1943. Returning from a bombing raid ED377 was attacked by a Junkers Ju 88 combat aircraft. Warrant Officer Sparkes bailed out over enemy-occupied territory, but the rest of the crew perished. James had suffered burns and was in pain, but he managed to hide his parachute and hid overnight in a ditch from the searching Germans. Had he been discovered he would have probably been shot on the spot. The following morning he headed for Chamtoce sur Loire in Western France, where a girl told him to hide in a bush while she sought help. Patriots linked to the Marie-Claire Escape Line, established by English-born Red Cross nurse Mary Lindell, led James over the Pyrenees during September. He arrived in Gibraltar on October 4 and was flown to Whitchurch the next day. After a spot of leave James was posted to RAF Helensburgh — considered a ‘safe posting’ — following his ordeal. Because of his experience in bombers MAEE assigned Sparkes to Flight Lieutenant Stewart Carswell, its senior test pilot at Prestwick. ‘Stu’ was a safe pair of hands, and as a result both men survived the war. When war ended the RAF Helensburgh flying boat base went on a care and maintenance standing. MAEE returned to its pre-war home of Felixstowe but kept a skeleton crew in Scotland to complete outstanding trials. James was among those who stayed on. On October 17 1945 he and ‘Stu’ Carswell flew the Wellington bomber NA929 with MAEE civilian worker Charles Bound aboard. Their job was to evaluate the dropping of a new type of depth charge mine. As instructed, Carswell flew the Wellington 50 feet above sea level at full throttle to drop a depth charge. But it exploded prematurely — damaging the aircraft, which then dived into Brodick Bay, Arran, sending all three men to a watery grave. Sparkes is listed on the Runnymede Memorial as being aged 26. A small white memorial stone at Toxteth Cemetery, Liverpool, records his death and that of his parents. His mother died during the Liverpool Blitz of May 1940, his father in 1942. The new memorial at Kidston Park is dedicated to the MAEE and men like James Sparkes and Stewart Carswell. “Lest we forget them — and all their colleagues,” Robin says.